In April, when I participated in the A - Z Blogging Challenge (yes, you could read all 27 posts here if you were so inclined. You're welcome! 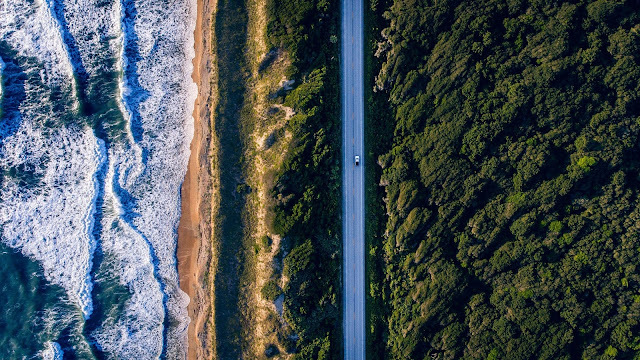 ), I mentioned on more than one occasion, that I have a "Great Driving Songs" playlist, and that it would be put to good use come late July when we began road trippin' from the Gold Coast in Queensland, to Sydney in New South Wales. My husband and I have discovered that we really enjoy taking road trips together. We've done a few in the short time we've been married - 5 days up the east coast of Tasmania and some shorter ones in the south-west of WA. I think what we love most is the relaxed pace, and the flexibility to go the long way around or take a short cut - whatever we feel like on the day. I also love that we both enjoy listening (and singing along) to great music or interesting and discussion-provoking podcasts, or else we just chat and laugh about the big and the small things. It's really so nice to spend time travelling together. I don't even mind trundling my suitcase up and down streets to find hotels or car rental depots, or on and off trains, buses and trams along the way (although I've noticed with age that my shoulders don't take so kindly to that these days). So after four long, but interesting, conference days on the Gold Coast (plus a teensy bit of sightseeing, a lovely morning walk on the beach, and some nice meals out) I was ready for our planned relaxing break and looking forward to the next week or so as we moseyed our way down the coast, and somewhat inland at times, towards Sydney. We had a week to get there, but had arranged to spend a few days with family in northern NSW, so that still left a little time to linger where we fancied. 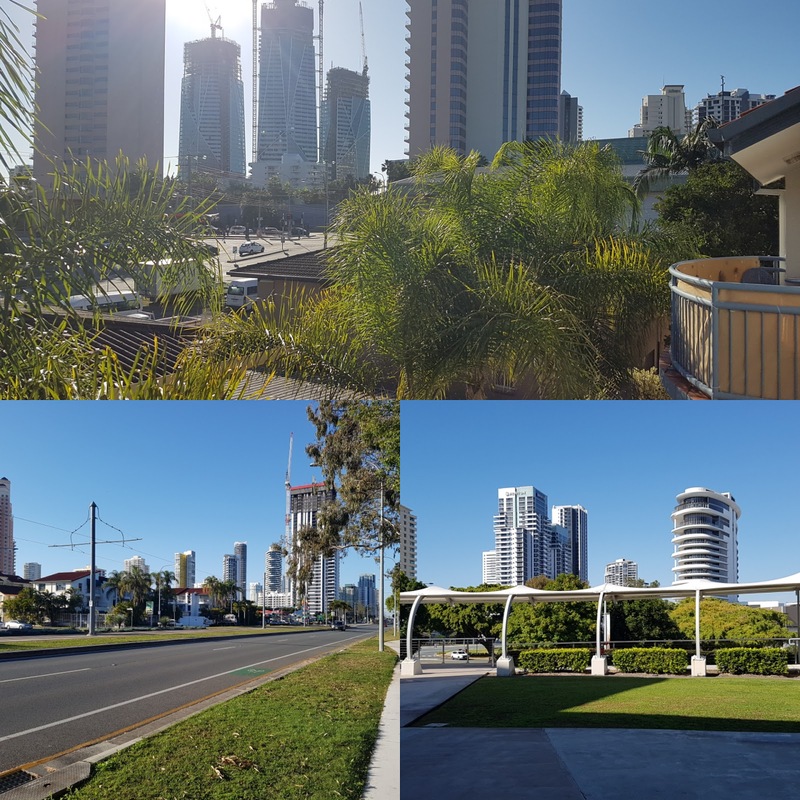 As we hopped on and off tram and bus to the car hire depot at Gold Coast airport, I was looking forward to throwing everything in the boot and taking off! Blessed with gorgeous blue-sky sunny days on the Gold Coast. Pity I spent most of my days in windowless rooms, but my morning and lunch time walks were beautiful. 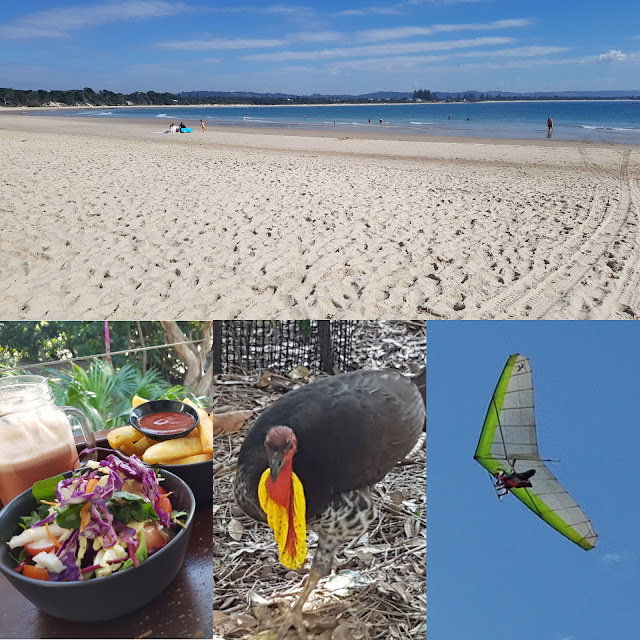 Our first stop was beautiful and iconic Byron Bay for a quick visit for lunch and a look at the beaches. The Pass Cafe was recommended to us by some friends who camp at Clarke's Beach near Byron Bay each year. The menu was amazingly healthy and delicious and we enjoyed our lunch from the large sun-dappled deck with glimpses of the bay through the trees and the odd bush turkey scratching happily in the gardens. It was a lovely way to go from "conference mode" to "holiday mode" in a very short space of time. 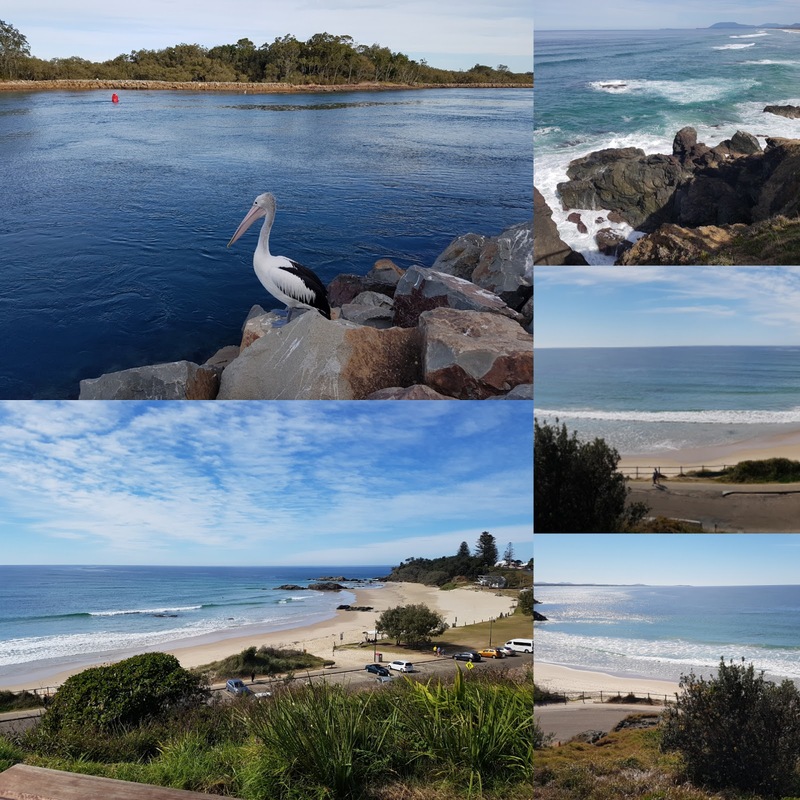 Byron Bay and Lennox Head, NSW. 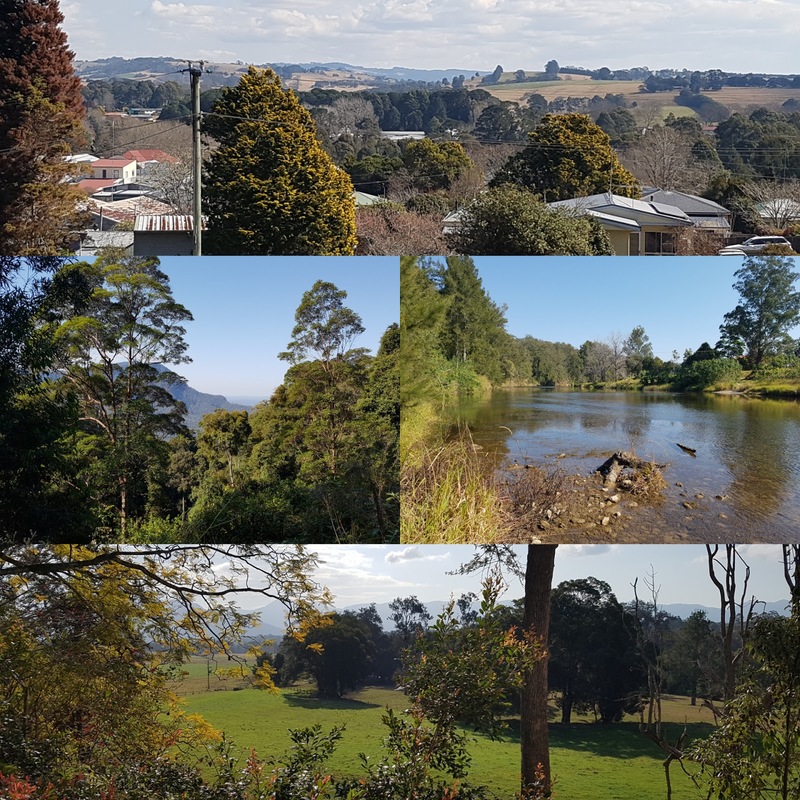 Day two took us away from the main highway and up into the mountains for a winding but very enjoyable drive through beautiful countryside to Dorrigo, a sweet little town my husband visited for work many years ago and wanted to share with me this time. How beautiful are these views!!! From Dorrigo we headed back towards the coast, stopping at Bellingen for lunch overlooking the valley. The quaint little restaurant Qudo was the perfect location, with gorgeous views and delicious Japanese food. Our afternoon drive took us all the way to the Camden Haven area, to spend a few days with family, who kindly devoted 3 days to our sightseeing. The first day was spent on a boat cruising on the Camden Haven River in several directions. The day was overcast and still, which afforded us the most beautiful reflections. Relaxing day boating on the Camden Haven River. Those reflections!!! The following day we drove on more winding dirt roads, followed by a short trek through the beautiful forest to Ellenborough Falls, one of the longest single drop waterfalls in the southern hemisphere. A plaque on the viewing platform added a tinge of sadness and a moment of solemn reflection as we stood at the top of the falls and read of a young local boy who lost his life playing too close to the edge in 2000. 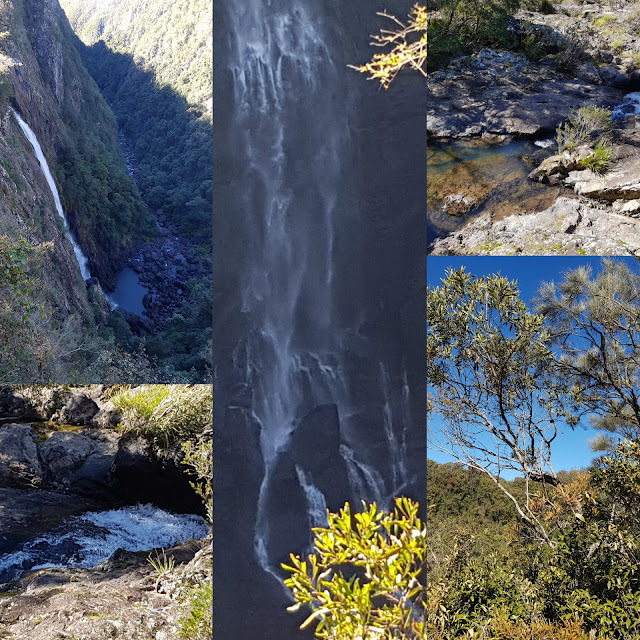 Ellenborough Falls, from the top and from across the gully. Our last day with family was spent exploring the coastal region from Port Macquarie to North Haven. We have such lovely coastline in Australia and we are certainly spoiled for beautiful beaches. I always think Perth beaches are wonderful (and they are), but then I find new ones elsewhere in Australia that are just as lovely. Then it was time to farewell family and get on the road again, continuing our journey south towards Sydney, stopping in to Taree and Wingham in the Manning River region, where my mum was born and grew up on a dairy farm, and where I visited my grandparents on a number of occasions in my childhood. I wanted to find the farm where my grandparents had lived, and turns out it wasn't too difficult. It was really lovely to see it from an adult perspective. It really is such a beautiful area. 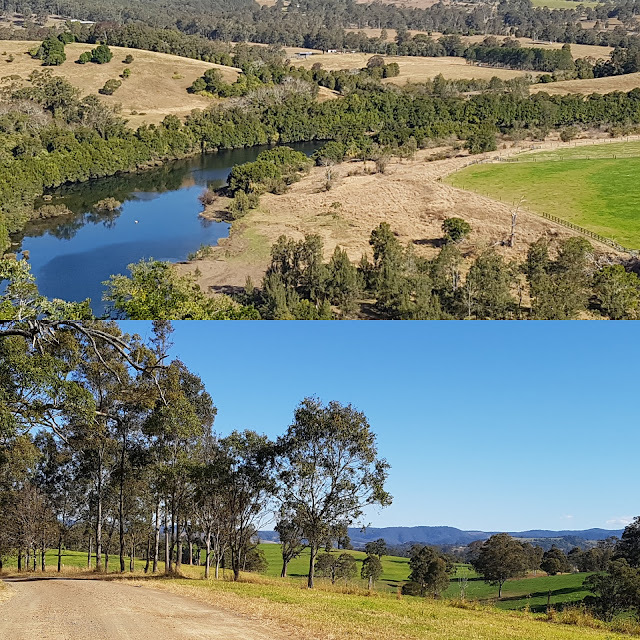 Dairy country in the Manning River region. We also found the house in town where my grandparents moved after they finished farming, and where I stayed as a teenager, as well as the memorial plaques at the local anglican church for my grandparents and one of my aunts - all three located together. We also stopped in to the permanent care facility to visit my other aunt, who I hadn't seen since I was about 16, and who had only recently gone into care due to declining health. It was a lovely visit for my aunt and for me. And finally, to Sydney and our last few days. Not exactly road trippin', more like endless foot trippin'!! We walked and walked, and were absolutely blessed with the most beautiful blue-sky days and mild temperatures, it was perfect weather for exploring a little of Sydney. We've both been here many times before, but never together, so it was quite a lot of "firsts" for us as a couple, which was lovely. The night after we arrived, we had tickets to see Rigoletto (Verdi) at the Sydney Opera House. Although we're not huge fans of opera - I don't mind some, and my husband will endure if he has to - we agreed it was kind of a "bucket list" thing to do, and too good an opportunity to pass up. 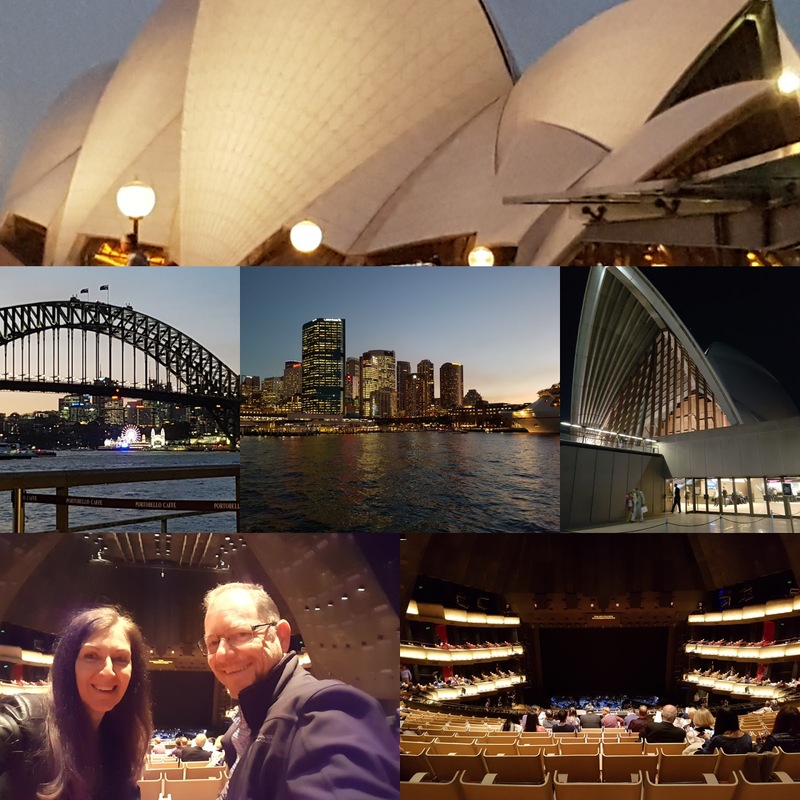 So after a lovely dinner by the harbour, we headed off for our first Opera House experience, and it really was a great night. For both of us! Sydney Harbour by night is lovely, and our Opera House experience was memorable! We fairly packed it in over our next two full days in the city. 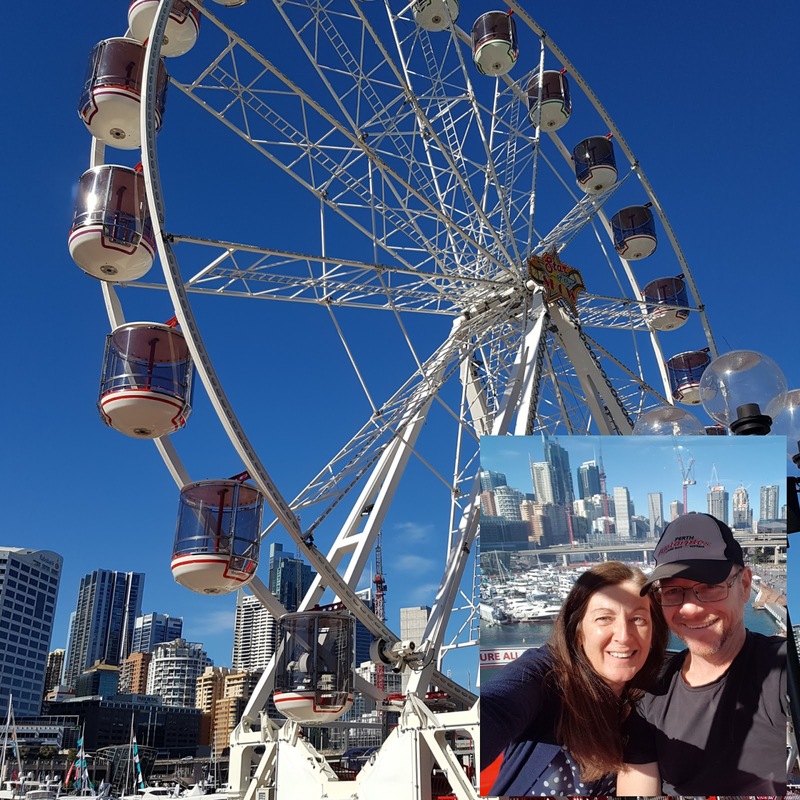 Rather than a formal harbour cruise, we decided to walk around the harbour side of the Botanical Gardens to Circular Quay and take the early morning ferry to Manly for breakfast. It was a great way to see the harbour and enjoy some time by the beach too. 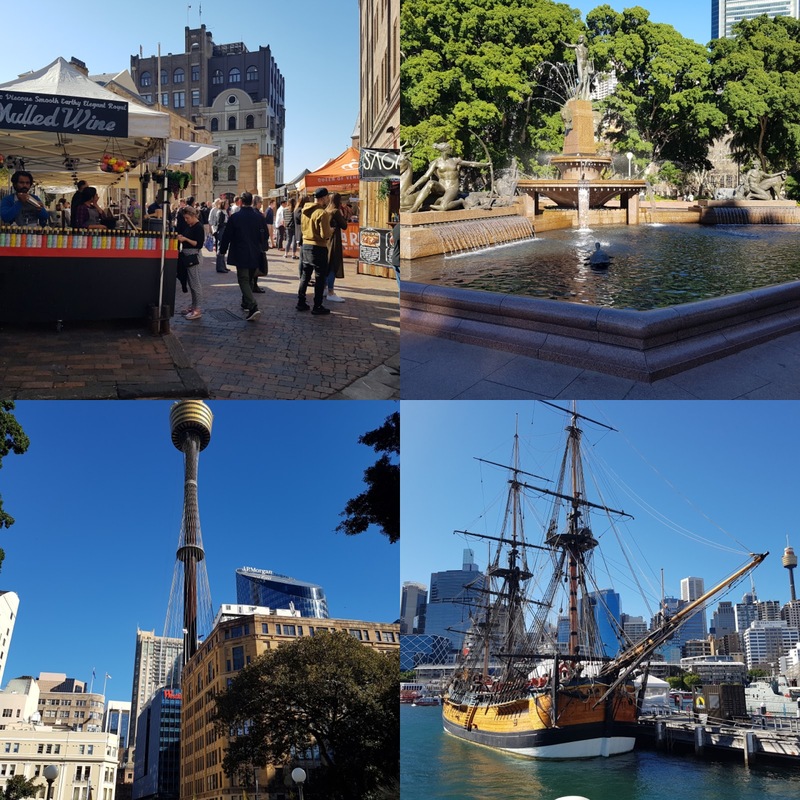 Once we were back city-side, we explored (among other things) the "Friday Foodie Markets" at The Rocks, Darling Harbour and the city centre, even taking a couple of hours out of our foot trippin' to see a movie, just because we could. Exploring The Rocks and Darling Harbour. And then we did this. Aawwww. Because my lovely husband said "C'mon, let me take you on the ferris wheel". True love. Reliving our teenage years on the ferris wheel. All in all we really did had a lovely time, we were abundantly blessed with the most gorgeous weather the whole time, and we both felt thankful, relaxed and refreshed by this lovely getaway. But no matter how good the holiday, it's always so nice to get home. Wow you certainly did have gorgeous weather! You missed out on nothing back home, we've had almost nothing but rain for the past 2 weeks, it's been very dreary. Beautiful scenery too, it really looks idyllic. Glad to hear you had such a nice time, and that your husband was romantic and kind enough to both go to the opera with you and on a ferris wheel! He's a keeper that one I think ;-). We definitely weren't missing the cold wet weather back home. Our house was freezing when we got back, and that was bad enough!! Well it looks like you've had a fabulous time Sue - glad the weather stayed fine for you and that you made the most of it. We loved Sydney when we went a few years ago and plan to go back again when we have the chance (Melbourne was a lot less appealing in comparison). Glad you're safely home again - welcome to Winter! Thanks Leanne, it was a lovely break. Always so nice to get away for a bit, but equally nice to be home again, despite the weather!! Great post! I was just saying to hubby yesterday when we were in Armidale how next time I want to use that as a base and go across Waterfall Way to Bellingen - I really love that area. 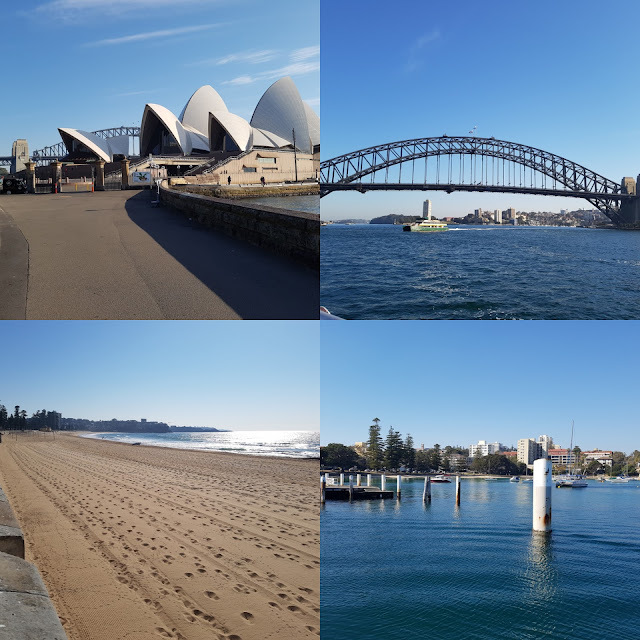 We moved out of Sydney 18 months ago for the Sunshine Coast, but I have to say, there's no beating the shining blue beauty of a late winter day in Sydney. Agreed Jo, there's just something about that sparkly harbour under an endless blue sky!! We loved our few days in Sydney, but equally we enjoyed the coast and the mountain areas. 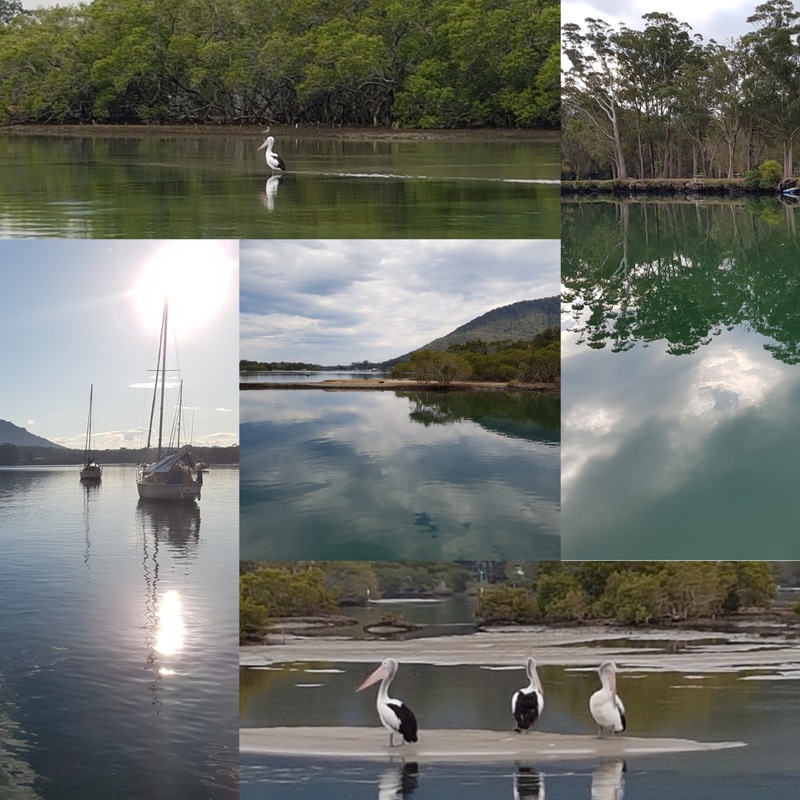 The Sunshine Coast is gorgeous too though, and hopefully you're loving your new home! There is certainly a lot of road-tripping we can do in Australia. We've seen a LOT of the west, but not much of the East...yet. You certainly need to be organised with packing, food and the playlist. Happy travels and thank you for stopping by my blog this week. It was lovely to "meet" you. 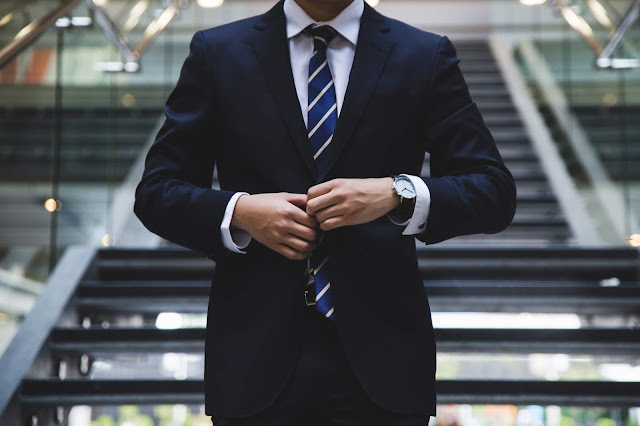 I'd love to hear your thoughts on this post. Please feel free to leave a comment! Welcome! My name is Sue, and as long as I can remember I've loved to write. I love words and tend to be somewhat verbose! Any opportunity for creative writing is fine by me - I love to write, edit, write more, edit more - and I particularly enjoy jotting down random thoughts and ideas about life, marriage, family, faith, and travel. My first blog was about my time in Paris a few years ago, and was mainly so my family could follow along. I love the creativity of a blog, and if others enjoy my ramblings then that's a bonus. Thanks for stopping by and please feel free to leave a comment. Who is Jane and what does she want? ?